When I moved with my children when they were 1 month and 2 ½ years old it was a difficult transition, primarily for me, because packing and unpacking are particularly burdensome when you’re already exhausted from caring for a newborn and a toddler. While my kids seemed less stressed out by our last move than I, the challenge of moving with kids seems even more daunting now that we’re nestled into schools and routines, and childhood friendships have formed. We’re here to help you understand why moving is so hard for kids, and to help you smooth the transition. Recognizing the effect a move can have on your child can help you prepare for the adjustments and challenges ahead. Moving with kids is hard primarily because of emotional issues. As stressful as moving is for adults, it’s not any less so for our children. A study in the Journal of Personality and Social Psychology documents that moving is tough on kids and the effects are sometimes seen into adulthood. The effects are potentially even more problematic for kids who are introverted, anxious, or have an inflexible personality. According to Christina Steinorth, author and licensed psychotherapist. “Moving brings feelings of sadness because of all the losses involved—the loss of school, the loss of friends, the loss of trusted teachers, babysitters, and the loss of certain routines.” Other negative effects of moving are academic challenges (e.g., teacher and curriculum expectations vary from school to school), self-esteem and self-worth issues, and separation anxiety. A major reason kids are sometimes negatively affected by a move is because moves often occur because of other problems such as a divorce or a job loss, says Frederic J. Medway, a professor of psychology at the University of South Carolina. These situations mean parents are stressed and upset and those feelings trickle down to the kids. The flipside to these effects is that a positive attitude from parents can change how the child views the move. A move is an opportunity to live in and learn about a new town, meet new friends, and maybe even be exposed to new cultures and a different way of life. For children who’ve dealt with academic problems or issues with friends, moving can even provide a fresh start. It’s most important to prepare your kids and to make them part of the preparations no matter their ages. Tell them why you are moving and where you are moving. Whether it’s because of a job offer, a sick relative, or any other reason, offer your child a clear, honest explanation. Explain the benefits of the move that relate to their interests—maybe the new school’s swim team or tech club will pique your child’s interest. Be honest about life changes the move may cause, but reassure your child that their life will remain much the same. Tell your child, “Even though we will live in a new city, we will still stay in contact with old friends and we’ll still do all of the same family activities we did before the move” (such as your weekly pizza night). Bring them house hunting with you, and let them participate in the decision-making process. Make a wish list together of some of the things you want in your new home, such as a bigger yard or a playroom. Infants are usually less affected by a move because they are too young to comprehend much of what’s going on, but your stress level or inability to care for them as you normally do can cause your baby to become irritable and restless. Maintain a consistent routine before, during, and after the move. Prioritize keeping as stable as possible while you are preparing to move, while you are in the process of moving, and after you settle into your new home. Routines keeps kids, and babies in particular, on an even keel. Call in help if you sense things are getting too chaotic or stressful. A family member or a babysitter can take care of your baby and maintain the routine while you take care of packing, contacting utility companies, and all the other tasks that come along with moving. Pack an essentials box or bag for the road or flight and for the first few days after you move into your new home. It should include diapers, wipes, diaper rash cream, baby food, clothing, favorite toys, and prescriptions (if necessary). Visit your pediatrician or family physician for a checkup to ensure your infant is in good health and ready to travel. Plan your road trip, taking note of the location of emergency clinics along the route as well as understanding where retail stores and parks or rest stops are so you can pick up supplies and have spots to stretch your legs. Baby-proof your home as soon as you arrive, or before you move in, if possible. Keep explanations about moving simple. Use stories to explain the move, or use toys to act out what will happen. Show your child pictures of the new place and important points of interest (e.g., a park near the new home, the library, their new preschool, etc.) to illustrate the move in a more concrete way. Read age-appropriate books about moving to your toddler. Some suggestions are The Berenstain Bears’ Moving Day by Stan and Jan Berenstain, Louis & Bobo: We Are Moving by Christiane Engel, Goodbye House by Frank Asch, Big Ernie’s New Home: A Story for Young Children Who Are Moving by Teresa and Whitney Martin, and Melanie Mouse’s Moving Day by Cyndy Szekeres (all available on Amazon). When packing toys, explain to your child that they are not being thrown away or taken away. If the new home is not too far away from your current home, make several visits to the new house and move a few toys each time so your toddler understands where their things are going. Pack surprises in your toddler’s moving boxes, such as new toys, to make unpacking more exciting. Arrange for a babysitter to stay with your toddler on moving day or when you are busy with packing or doing other jobs related to moving. Do not make big changes, such as potty training, before or immediately after the move. Before leaving the old house, take your toddler into every room one last time and say goodbye. Create a sense of normalcy as soon as possible after moving into your new home. Keep your toddler’s routine as normal as possible before, during, and after the move. Set up your toddler’s room right away. You may even consider arranging furniture in a similar way as it was previously arranged in their old bedroom. Make sure your child has access to all their favorite toys and books. Illustrate where you are moving with not only pictures, but also with maps of the road trip (starting from your old home to where you’re moving) and of the new community. Show them where their new library, parks, and other points of interest are in their new town. As with toddlers and babies, keep your young and middle school age kids’ routines normal before, during, and after the move. Kids of all ages thrive on routines. For example, keep bedtimes consistent and if you always read books before bedtime continue to do so after the move. Encourage your child to make a list of questions about moving to ask you, and answer them openly and honestly. Read books together about moving. Younger children (ages up to 8) might enjoy Where I Live by Eileen Spinelli, Maybe Yes, Maybe No, Maybe Maybe by Susan Patron, Little Critter: We Are Moving by Mercer Mayer, and Katie’s Big Move! by Maria St. Inacio. Older children (up to age 12) may enjoy Moving Day by Meg Cabot, The Moving Book: A Kids’ Survival Guide by Gabriel Davis and My Very Exciting, Sorta Scary, Big Move by Lori Attanasio Woodring, PhD. (all available on Amazon). Make an address memory book together listing your child’s friends’ phone numbers, addresses, and email addresses to encourage them to keep in touch with their friends after the move. Include photos of the old home, friends, and memories. Hand-written letters or postcards are a fun way for your child to reconnect with friends after the move. Draw a floorplan of your child’s new room and allow your child to pick out paint colors for the walls, select decorations, and decide how to arrange furniture and toys. Pack some surprises in your child’s moving boxes, such as a new toy or book, or a new shirt for the first day of school. Take a last tour of your old town and say your goodbyes. Visit your favorite places, and visit friends, neighbors, and anyone else you want to say one last goodbye to. Plan a fun night. Within the chaos of moving, make sure to take some time for fun and plan one night (or more) to take a break and spend time together having fun as a family. Visit the local arcade, hit up the laser tag center, or have a game night. Encourage your child to become involved in your new community. Enroll your child in extracurricular activities, set up playdates with new classmates, host a party at your new home and invite neighbor kids, and find kid-friendly places to meet other children such as the park, YMCA, or church. Take a tour of your new town and explore it like a tourist to get your child excited about all the new town has to offer. Tell your teen as soon as possible after you know you are moving, and tell them honestly why you are moving. Moving is often hardest for teenagers as they have well-established friendships, and even romantic relationships. They will need time to get used to the idea and to work through any emotions they feel. Give your teenager reasons to feel excited about the move. Do your research and present to your teenager a list of positives for them in the new community and in their new home. A move may mean a bigger room for them, a pool in the backyard, or a community with more activities suited to their interests. Help them understand what opportunities apply to them personally, including extracurricular activities and school courses and programs. Encourage your teenager to write in a journal to express their feelings about the move, and to record memories of this transition period in their life. If your teenager is a senior in high school, considering letting them stay with a family member or trusted friend in the community to finish out the school year. Encourage your teenager to get involved in extracurricular activities in their new community so they can make new friends faster. Don’t overact if your teen acts angry or tries to talk you out of the move. It’s often best to back off and give your teen time to process the news, even if they slam the door in your face when you try to talk to them. You are the adult, and the best action you can take is to give your teen space and to respond calmly. Give your teen one last opportunity to say goodbye to their friends by visiting them or throwing a going-away party. Pack a bag of favorite toys, games, activities, and snacks to keep them entertained on the car or plane ride. Inject fun into the road trip by playing road trip games. Some commonly known and not so commonly known examples are 20 Questions, Name That Tune, Road Trip Bingo, Cows on My Side, Word Association, Regional Food Master, and The Movie Game. Pack meals, toiletries, and other basic essentials for long road trips including paper towels, disposable plates and utensils, soap, toothbrushes, toothpaste, a change of clothes, plastic bags for dirty laundry, a flashlight, tool kit, and trash bags. Make the road trip into a vacation by visiting historic landmarks and other places of interest along the route. Websites like Roadtrippers.com help you map out your trip and find points of interest to visit. Offer your kids the opportunity to get out of the car and stretch every time you stop for gas. Look for parks and open green spaces along the route to give your kids an opportunity to release pent-up energy. Bring along balls, Frisbees, and other sports equipment. The more frequently a family moves the more important the need for familial stability. Preparation and active involvement are important concepts when it comes to moving kids of all ages. Children need to know the plan, have a sense of involvement in the plan, and have a reason to feel excited about the move. 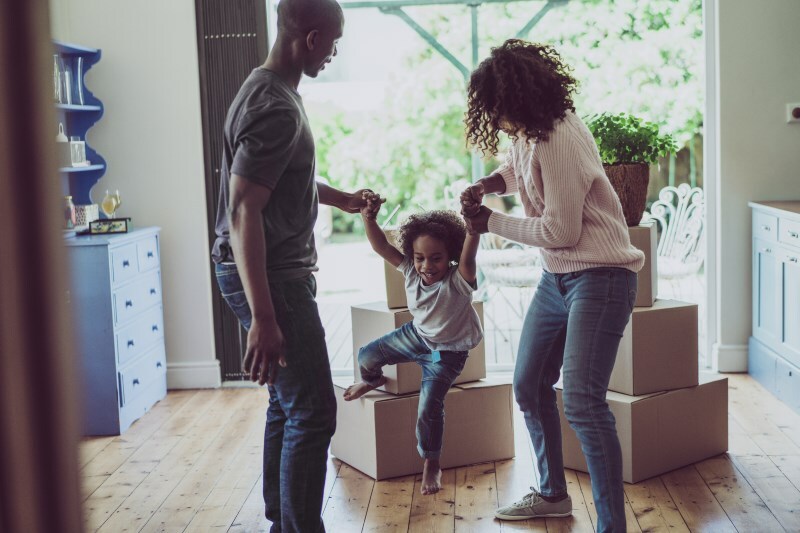 With the proper support from parents, moving can be a positive experience for children, leading to increased self-confidence and fostering interpersonal skills.